Rails - Curbs Plus, Inc. The CPR system is designed to sit between an existing roof curb and curb mounted piece of equipment. The CPR is designed to reduce the vibration from a roof curb mounted piece of equipment to the building structure. 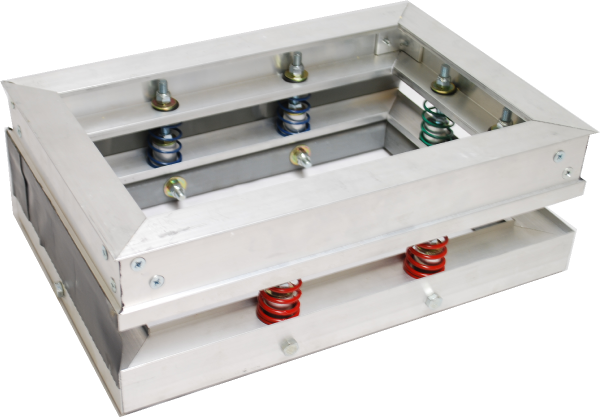 Along with reducing the vibration from the unit, the CPR also acts as a seismic and wind restraint to keep the unit attached to the roof curb. Curbs Plus, Inc. will engineer each CPR system to match the specified unit and meet any customer requirements. The CPR system is available in either 1” or 2” deflection depending on the customer’s requirements. The CPR system is shipped nearly fully assembled with the springs and restraints installed at Curbs Plus, Inc. in order to reduce onsite labor. On site, the CPR design allows for quick assembly requiring only basic tools to install it to the existing roof curb. Curbs Plus, Inc. is a manufacturer of conventional and pre-engineered metal building roof curbs, curb adapters, architectural equipment screens, diffusers and more. We are headquartered in Ringgold, Georgia with additional facilities in El Dorado, Kansas and Mount Union, Pennsylvania. Curbs Plus is recognized for our quality, responsiveness, and on time delivery. © 2019 - CURBS PLUS, INC.